In 2008, my agency Trepoint launched its very first influencer marketing program. Since that time (and with the benefit of many more campaigns and years of experience), our influencer marketing programs have evolved quite a bit. 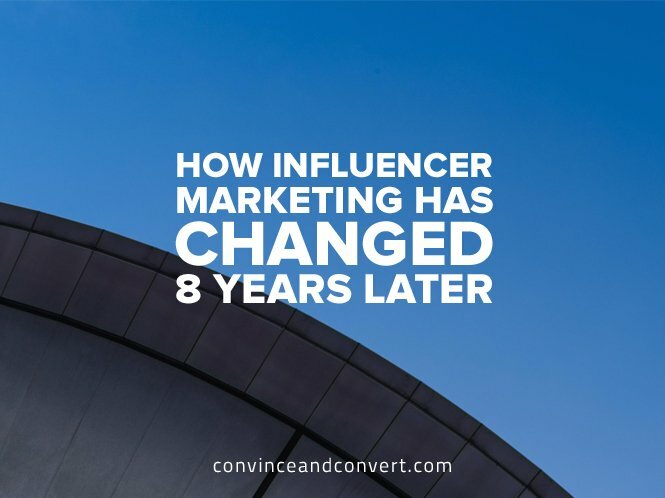 It’s important to understand both what has stood the test of time and what’s gotten a lot better as the influencer marketing industry has matured. While you might have jumped on the bandwagon of Facebook and Twitter by 2008, the impact of social media at that time was nascent by today’s standards. When Facebook launched in 2004, it was only open to the public in 2006 with 12 million users. In 2008, Facebook only had 145 million. Today, Facebook boasts more than 1.57 billion. Facebook fundamentally changed the game of digital advertising because each of its users had filled out both a demographic (age, gender, location) and psychographic (hobbies, favorite music, movies) profile. This gave both marketers and influencers more transparency into precisely who they could reach. For marketers, this helped them reach their ideal customers—less “spray and pray” and more reaching the right person at the right time. For influencers, this helped build their tribe. No longer did influencers have to guess who their audience was. Facebook ushered in a platform of analytics that went way beyond what had previously been available to influencers via free tools like Google Analytics. Many influencers used these tools to grow their audience and better understand what their audience liked and engaged in, providing a real-time feedback loop which empowered continuous improvement. To combat Facebook’s growing advertising dominance, publishers upped their own game with better tracking pixels and retargeting. The privacy “war” was lost entirely, and consumers started to get bombarded by advertising messages. The promise of more relevant ads, however, missed the mark. As a defensive measure, people got really good at ignoring digital advertising, from installing ad blocking software to the onset of banner ad blindness. In 1995, my best banner ad campaigns would deliver 44 percent click-through rates. Today, the industry standard banner ad click-through rate is 0.04 percent (per DoubleClick 2015). That’s basically a rounding error, and yet banners are still the dominant platform of digital advertising. The massive drop in performance has given pause to any advertiser who is looking for better ways to reach and engage their audience. Over the last eight years, influencer marketing has grown as one of the few viable alternatives to banner ads. As banner ads have plummeted, Amazon, Yelp, Google and many others have realized the power of the peer-to-peer review. From products purchased to restaurants visited, people want to hear the experiences of others with things they have not yet tried themselves. Moreover, someone who has had a bad experience will go out of their way to document what went wrong, so that others can avoid a similarly bad experience. This has been a growing trend over the past eight years and is now a habit for many. Think about it: Will you buy any product on Amazon without checking the reviews? If someone recommends a restaurant, chances are you’re checking Yelp before making a reservation. Just about every industry has their designated review site, and consumers have been trained to check reviews before making a purchase decision. This has further paved the way for vocal influencers in any industry to rise to the top. In 2008, the word “influence” online was synonymous with “celebrity.” Sure, some may have qualified for celebrity status in ways like “YouTube Celebrity,” but most marketers were only interested in taking their celebrity endorsement strategy from television to social media. The difference, however, was that marketers were empowered to see what happened after the celebrity would post or tweet about a brand. And a funny thing happened: Marketers began to see, via their reporting and analytics, that popularity wasn’t a direct correlation to engagement. Just because a celebrity had millions of followers didn’t mean that translated into high levels of engagement for the product or service they were marketing. Instead, non-celebrities were delivering much higher levels of engagement (for a fraction of the cost of celebrities). Influencer marketing, it turned out, was more effective when driven by non-celebrity influencers who had worked hard to deliver value to their audience despite not being as popular as celebrities. Over the past eight years, the term “big data” has gone from obscure to ubiquitous. True, the level of data captured has grown exponentially during this time, but what’s more important is that marketers are actually data wrangling and separating the signal from the noise, as Nate Silver taught us to do. When it comes to influencer marketing, this is about going beyond the surface metrics of Facebook and Twitter followers and digging deeper into engagement scores—and, where possible, purchase decisions. Two influencers with similar costs used to be judged primarily by their follower counts, but today, it’s their engagement scores that matter most. Companies like TapInfluence have done a marvelous job of mining this data so that marketers can vet potential influencers before ever reaching out to them. More sophisticated tools and technology also allow marketers to better monitor and manage their influencer marketing programs. Eight years ago, it would have been nearly impossible to actively track, measure, and improve upon a campaign with hundreds of influencers simultaneously. Today, it’s not only commonplace but an expected and necessary component of effective influencer marketing. By quality content, I don’t mean beautifully designed infographics and blog posts that tell the world how great your company, product, or idea is. Quality content is about understanding what your audience really wants to know and delivering that knowledge as incredible value, for free and with no strings attached. I recently interviewed Jay Baer for an Inc article (see “Jay Baer: How Content Drives Commerce“) and I love his example of River Pools and Spas. In 2008, if you couldn’t pay your mortgage, you had exactly zero interest in investing in an in-ground pool in your backyard, and River Pools and Spas was in a world of hurt. They took to their blog to write more than 300 blogs posts answering every question any prospect had ever asked them. In doing that, they not only survived in 2009, but shortly thereafter they became number one in their industry. In tracking their metrics, River Pools and Spas discovered that their average customer read 100 pages of content before reaching out to someone live. Why is that? Because when you’re seriously considering making a major purchase, you’re looking for all sorts of information to help you make an intelligent business decision. By identifying and proactively answering every question you could possibly ask about an in-ground pool, they drove deep engagements with their prospects and their sales skyrocketed. Remember all those companies you can use to purchase Facebook and Twitter followers? While that may have helped with some initial social media credibility, all those bots and unqualified followers are actually hurting those companies’ ability to truly influence anyone. This is because success is no longer measured in impressions, but rather in real engagement. This was just as true eight years ago as it is today. Real influencers are the people who have actively engaged their audience by delivering incredible value and, through that value exchange, have earned the right to make recommendations that are relevant to their audience. By disclosing upfront that they are being compensated for these posts, they further retain the trust of their audience (and stay in compliance with advertising laws), as long as the products and services they are recommending are indeed relevant to their audience. Last year, we wrote an ebook called The ROI of Social Media, and it is still our most liked and retweeted post on Twitter. That’s because we didn’t force anyone to fill out a form to download it, nor did we talk about how awesome Trepoint is. Instead, we used Michael Lewis’ Moneyball insights about baseball to explain why most marketers were measuring the wrong thing (i.e., impressions and reach) rather than working backwards from their cash register to track and measure what matters. When you do this, you cut through all the inflated numbers and get to the heart of earned media that delivers sales results. This is true influencer marketing, and it comes from influencers who are authentic and transparent. It turns out that when influencers are highly engaged with their audience, their audience takes their recommended actions. This is precisely what marketers are looking for in influencer marketing. Earlier this year, the marketing industry was buzzing about Morgan Stanley analyst Brian Nowak’s quote in the New York Times, which read, “In the first quarter of 2016, 85 cents of every new dollar spent in online advertising will go to Google or Facebook.” In 2008, Google was the more dominant force, but even at that time we could see a huge amplification effect from Facebook. Today, both platforms are critical to your success in influencer marketing. Facebook still delivers the largest social media audience, even though organic reach of that audience has all but gone away. Savvy influencers monitoring this trend have cross-promoted their blogs, websites, newsletters, and other “owned” platforms, so that they can speak directly to their audience as a form of disintermediation from Facebook’s growing advertising tolls. Over the past eight years, Google has continued to dominate search with its successful migration to mobile. Google amplifies relevant influencer marketing content via organic search, as long as that content answers the important questions people are asking. This brings us to a final section about the long tail of influencer marketing. Any influencer marketing content that resonates will have a second life (post-campaign) via organic search pick-up. The long tail of influencer marketing is that most campaigns continue to pay out more than a year after the campaign has ended. WhiteWave Foods discovered that if your content is evergreen, not only will it continue to be relevant, but you could actually experience a spike post-campaign that outperforms all other peak periods during the campaign itself. WhiteWave Foods promoted recipes in support of their Meatless Mondays campaign, which ran in the fourth quarter during football season. They experienced their largest spike during the Super Bowl, when many house party hosts were actively searching for vegetarian options to serve at their upcoming Super Bowl party. If the content is relevant and highly sought-after, it will be found. If you’re interested in learning more, Trepoint holds a free influencer marketing webinar twice a month. Armed with the right tools and insights, your marketing programs are sure to crush it. Bill Carmody is the CEO of Trepoint, a boutique digital marketing agency focused on Consumer Packaged Goods and B2B Enterprise challenger brands.